Browsers are becoming more and more powerful. Browsers are now able to do what was previously only possible with native apps, and web apps that take advantage of the modern browser capabilities go under the name Progressive Web Apps. This includes a browser specification that enables browsers to have functionality such as offline availability, hardware support, and Bluetooth. Also, new browser specifications are enabling what was previously only available for SPA frameworks to the browser natively using web components that are encapsulating functionality and styling with techniques such as shadow dom and creating web components using custom-elements. 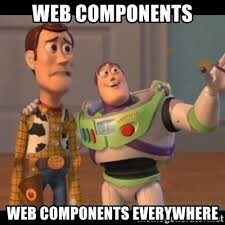 Angular has created a library for converting components into custom elements. This enables us to write components using the Angular framework and run the component in non-Angular applications. That way you can mix different front-end frameworks, as it all gets compiled to custom-elements. Let’s see how easy it is to convert an Angular component to a custom element. We are gonna create a simple demo of an Angular app by creating a component and using it to create a custom-element like in my Github demo. Hereafter you create a new component, that will later become a custom-element. Make sure to set ViewEncapsulation to native since we are to be working with custom-elements. The HelloComponent is the component we want to create a custom element from. To do this we need to add it to declarations and entryComponents because the component is being created programatically (not created in a template). We want to use our custom element as our bootstrapped component, so to do this we need to setup the ngDoBootstrap lifecycle hook. Also we need to ensure that AppComponent is removed from the declarations and bootstrap properties in the decorator of AppModule. In the ngDoBootstrap create a new custom-element using createCustomElement. Make sure to provide the injector. Define the custom element using define. Here you specify the custom-elements HTML tag and the custom element to create. And you should see the HelloComponent being rendered! Unfortunately the way to use a custom elements created with Angular Elements is to build the bundles with ng build --prod --output-hashing=none and concat all the js files into one. Currently this creates a pretty big bundle size, especially for an App that just displays some text. For this reason, it might not be reasonable to use Angular Elements in production yet. Angular v7 and the Ivy renderer should make the published bundle of custom-elements created with Angular Elements even smaller, making this more useful in production. Also as the custom-element standard gets implemented in more browsers polyfills might not be needed anymore. We discussed the benefits of creating framework agnostic apps using Angular Elements and saw how easy it is to convert an Angular component to a custom-element. Still, the technology has some drawbacks in a big bundle size and the need for polyfills to ensure browser support for custom-elements.